The Freedom From Religion Foundation is calling on the United States to break off diplomatic relations with Saudi Arabia. The Saudi regime’s torture and murder of dissident Jamal Khashoggi has exposed the brutality of the country’s ruling apparatus. But the problem with the country is far more fundamental: It is an absolute theocracy. The Saudi Constitution is essentially the Quran. When that is the basis of your legal system, regression reigns on all fronts. This is most glaringly obvious when it comes to women’s rights. The ban on women drivers may have been lifted (a cynical p.r. ploy by Crown Prince Mohammed bin Salman) but women continue to be second-class citizens. “The country’s odious male guardianship system is still firmly in place, so women in Saudi remain at the mercy of their male relatives if they wish to travel abroad, marry, work or get health care,” Human Rights Watch remarked when the revocation of the driving proscription was announced last year. But the damage that the Saudi fundamentalist monarchy is doing is not limited to home base. Indeed, the virulent Wahhabi form of Islam that the kingdom patronizes and globally disseminates has fomented extremism and terrorism around the world. 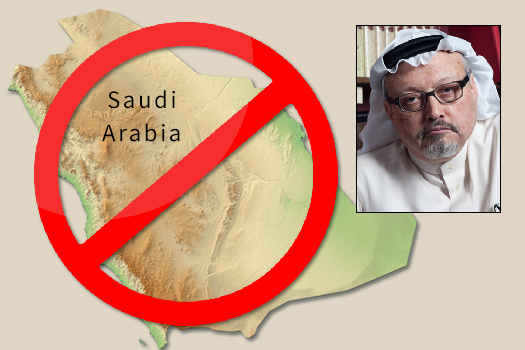 From Indonesia and South Asia to the Balkans and North Africa, the Saudis are busy undermining pluralism and tolerance. In a December 2009 leaked diplomatic cable, then-Secretary of State Hillary Clinton stated that entities in Saudi Arabia were the “most significant source of funding to Sunni terrorist groups worldwide.” She said that “the groups funded included al-Qaida, the Taliban and Lashkar-e-Taiba” (the group responsible for the 2008 attacks in Mumbai, India). The Saudi regime is terribly sectarian, too. The hardline Sunni variant that the regime practices views the Shiite branch of Islam as akin to apostasy. That’s the major reason the Saudis have engaged in a multipronged war to combat the Shia clerics of Iran — a fight in which they have enlisted the United States on their side. In fact, Saudi drums are now beating to all-out attack Iran. The Saudi monarchy’s aggressions have gotten worse under the crown prince, the alleged mastermind behind Washington Post commentator Khashoggi’s dismemberment and murder. Not only have been there no consequences, but the Trump administration has bent over backward to offer excuses for the monarchy, openly citing U.S. profits from weapons deals — munitions responsible for terrible suffering and tens of thousands of deaths in Yemen. (The U.S. Religious Right push to maintain close ties with Saudi Arabia was made clear in TV evangelist Pat Robertson’s remark about the advisability of not risking “$100 billion worth of arms sales” by taking on the Saudi regime.) Sadly, such genuflection has been truly bipartisan in U.S. history. The one act that Presidents Obama and Trump have both engaged in, literally, is bowing before the Saudi king. The Saudi monarchy is fundamentally at odds with American values and constitutional principles. It is beyond redemption and reform. The Freedom From Religion Foundation is proud to have been combating the Saudi government in its own small ways (spotlighting, for instance, at its upcoming convention a dissident, Ensaf Haidar, working to free her imprisoned husband Raif Badawi). The United States needs to follow the state/church watchdog’s lead and refuse to have any truck with the Saudi regime.